In the latest edition of the Hatchet Herald, Psychopathic Records released a full list of Shockfest tour dates. 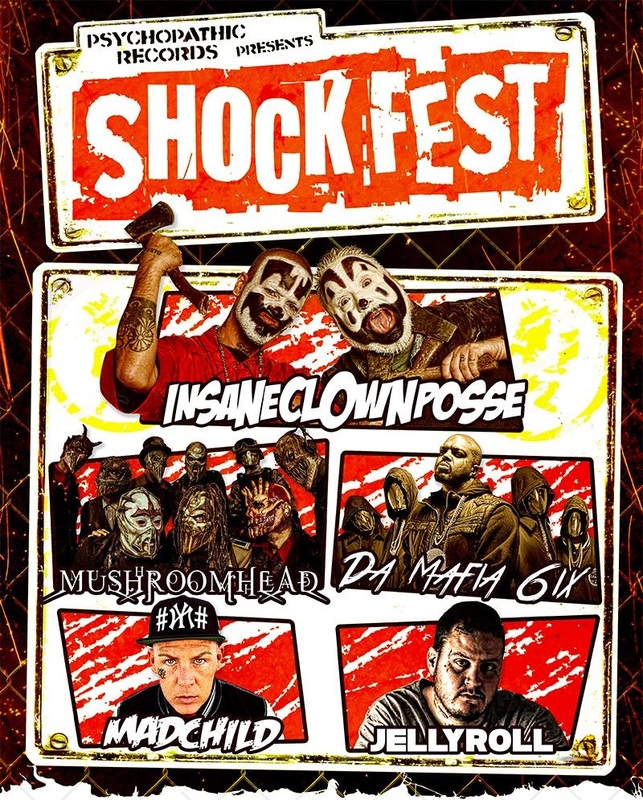 The Shockfest tour will feature Insane Clown Posse, Da Mafia 6ix, Mushroomhead, Madchild, and Jellyroll. The Shockfest tour is kicking off on September 25th in Grand Rapids, MI and concludes on October 31st in Detroit, MI. You can pick up VIP packages for Shockfest by CLICKING HERE or Hallowicked by CLICKING HERE. You’ve been clamoring for more Faygo rain…and a Rock-N-Rye storm is definitely-a brewin’! On September 25, Insane Clown Posse will be throwing the switch on…SHOCKFEST! This expansive, nationwide tour of freshness not only includes a brand new show from those lovable serial killin’ clowns Violent J and Shaggy 2 Dope but full performances from some of the best rap and rock acts in the land including metal juggernauts Mushroomhead, the horrorcore menace of Madchild, and Gathering favorite and Waffle House menace, JellyRoll. Also on this tour will be longtime ICP homies Da Mafia 6ix, who along with the Clowns will be debuting material from their brand new supergroup…The Killjoy Club! This is Psychopathic history in the making, so get those tickets now! The tour kicks off in Grand Rapids, Michigan and concludes on the most terrifying night of the year … Hallowicked. Right here in Detroit Murderous, baby! To get the full ShockFest effect, you and your homies are definitely going to want to get a VIP package when you come see ICP and the rest of the bands! A VIP package not only gives you a one-on-one meet and greet with Violent J and Shaggy 2 Dope, but also gives you a hook up on a bunch of exclusive gifts JUST for our VIP holders, as well as a special keepsake laminate AND the chance to participate in Faygo Armageddon at the end of the show! VIP packages are available HERE at Hatchet Gear; just use the pull-down menu to find what show you’ll be attending and just add it to the cart! Simple! SEE YOU AT THE SHOW!! WHOOP WHOOP!! *Reminder: VIP packages do not include a ticket to the show. All concert tickets are sold separately and you must have a concert ticket in order to get the VIP package.